The Federal Reserve published its triennial look at family income and wealth today, and it ain’t pretty. The chart on the right provides the basics. 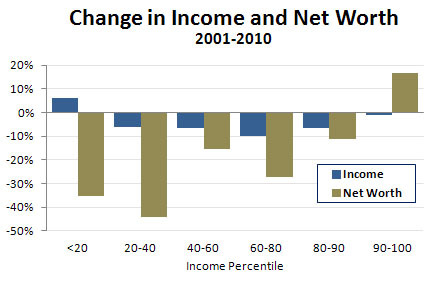 The poorest families (far left) showed a slight gain in income since 2001 but a 35% loss in wealth. The richest families (far right) showed flat incomes and a 16% increase in wealth. The families in the middle — the vast majority of the country — showed substantial losses in both income and wealth. ….The report highlighted the fact that households had made limited progress in reducing the amount that they owed to lenders. The share of households reporting any debt declined by 2.1 percentage points over the last three years, but 74.9 percent of households still owe something and the median amount of the debt did not change. It’s unlikely that these numbers have changed substantially in the past 18 months. If you want to know why the recovery has been so sluggish, you don’t need to look much further than this.